The New York Times has released a free online game of sorts called "The Voter Suppression Trail." As you may have guessed based on the name, it’s a parody of the classic Oregon Trail computer game, which was ubiquitous in classrooms in the 1980s and 90s, except it’s tailored to educate players about voter suppression, not nineteenth-century pioneering life. What the game really amounts to, though, is a clever attempt to boost voter turnout amongst young people, a demographic that often lags behind others in voter participation. In "The Voter Suppression Trail," players choose one of three voter types to play as: A white programmer from California, a Latina nurse from Texas, or a black salesman from Wisconsin. From there, all the player needs to do is go to his or her polling place and cast a vote. However, as you might expect, both of those tasks are much easier to accomplish if you play as the white coder. The white Californian simply strolls up to his polling place, casts a vote, and leaves. 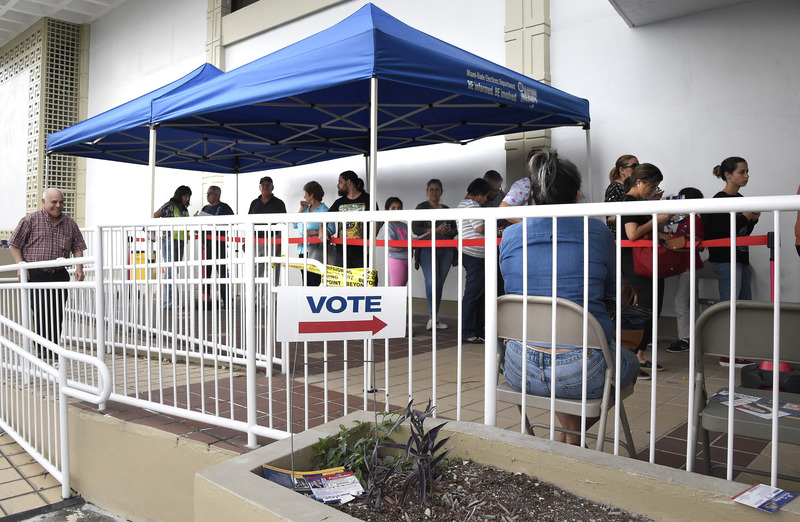 But the Latina Texan and black Wisconsinite have to deal with long lines in the cold, angry phone calls from bosses asking why they’re not back at work yet, understaffed polling locations, intimidating “election ‘observers'” and more. As the obstacles stack up, so does the voter’s “frustration level.” A ticker at the bottom lets players know how long their voter has had to wait to cast their vote, and all of this plays out in glorious 8-bit-style graphics. On the one hand, the simulation is an effective way of driving home the real-life effect that things like voter ID laws (which are specifically referenced in the game) have on voters in certain states. For instance, if you play as the Latina nurse, you might get a call from the day care center informing you that it’s time to pick up your child. Do you stay in line to vote, or pick up your kid? If you leave to get your kid, you lose the game, because you don’t get to vote. But if you stay in line, the day care center charges you a fee. And your child gets mad at you. Americans in states with restrictive voting laws often have to make excruciating decisions in order to cast their ballots. We saw this in Cincinnati on Sunday, when an estimated 4,000 voters formed a half-mile-long line as they patiently waited to vote, and there have been absurdly long voting lines in other places as well, such as Nevada. "The Voter Suppression Trail" zooms in on what type of impact these lines actually have on voters. On a more subtle level, though, this game appears to have the more specific goal of getting millennials to the polls on Tuesday. As anybody who’s used the Internet in the last few years can tell you, 90s nostalgia is very popular right now amongst, well, people who grew up in the 90s. And The Oregon Trail remains one of the most beloved pop culture touchstones of the 80s and 90s. Millennials who play "The Voter Suppression Trail" will come for the nostalgic trip down memory lane. But by the time they’re done, they’ll understand why minority voters in swing states might not end up voting on election day — thus making their own vote that much more important. And they’ll also be presented with a link directing players to their polling place. Voter suppression is a huge problem, and so is the relatively low rate of voter participation amongst millennials. "The Voter Suppression Trail" appears to be the Times’ attempt to raise awareness about the former, while actively trying to fix the latter.